Heat oven to broil. Coat baking rack with nonstick cooking spray. Place rack over baking sheet; set aside. Stir together bread crumbs, garlic powder and thyme in a pie plate; set aside. Stir together mustard and mayonnaise. Reserve about 1/2 cup of mustard mixture for dipping sauce. Brush chicken pieces with remaining mustard mix; place chicken in pie plate with bread crumb mixture, spooning crumbs on top of pieces and pressing to adhere. Transfer to prepared baking rack. Broil for 10 minutes or until cooked through. 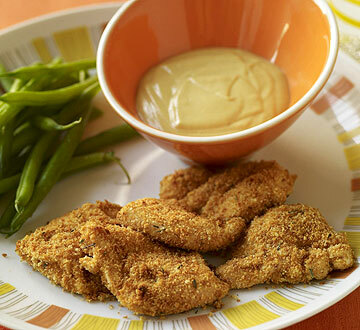 Serve with reserved dipping sauce and green beans on the side. PER SERVING: 397 cal., 10 g total fat (2 g sat. fat), 106 mg chol., 842 mg sodium, 28 g carb. (3 g fiber), 44 g pro.